Fire pits are a hot commodity! These attractive additions can dress up a drab yard with mesmerizing flames while serving as a gathering place for afternoon barbecues, evening drinks, and late night s’mores. Before building a fire pit, however, you should become fully informed as to local regulations, construction requirements, and potential hazards. So study up here with these dos and don’ts so you won’t get burned! DON’T build a fire pit without approval from local authorities. Your local government, homeowners association, and house deed may impose restrictions on the size, location, material, and fuel type of home fire pits—or forbid them altogether—due to the potential for fire-related property damages. If your fire pit flouts these rules, you may be fined. Contact your municipality’s planning office and homeowner’s association, and review the deed for your house, to ensure that you comply with all restrictions and obtain any permits required for fire pit installation. DO consider accessibility when choosing a fire pit size. Building a fire pit yourself offers room for customization on every detail, size included. Local ordinances permitting, your fire pit should ideally measure between 36 and 44 inches wide (including the width of the walls) to accommodate multiple people around it while maintaining an intimate setting. Aim for a fire pit height of 12 to 14 inches from the base of the walls to the top of the walls if you want guests to be able to prop their feet on it while seated around it on standard 18-inch-tall dining-height patio chairs. Increase the pit height to 18 to 20 inches tall if you want to be able to comfortably sit directly on the edge of the pit. DON’T position fire pits in hazard-prone zones with unfavorable winds. Plan to install your fire pit on a patch of level ground in an open area of the yard that’s at least 15 feet from other residences and at least 10 feet from property lines, flammable structures such as wooden sheds, bushes, and trees. In addition, use the National Water and Climate Center’s Wind Rose tool to identify the prevailing wind direction in your location; you want to ensure that you won’t have smoke blowing into your home through open doors or windows. DON’T use flammable or non-porous, water-retaining building materials. 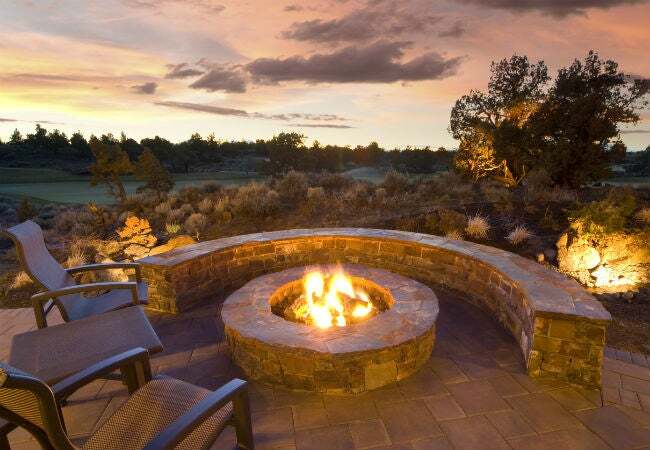 Fire pits commonly consist of an inner wall, an outer wall, a “cap” (i.e., a flat tabletop-like surface around the opening at the top of the pit), and decorative stones or rocks in the center of the pit. The inner wall must be made of fireproof building materials, optimally fire brick; the outer walls should still be heat-resistant but can be made of traditional brick, stone, masonry blocks (consisting of brick, concrete, granite, etc. ), concrete pavers, or even heat-resistant outdoor stucco or tile. Flagstone and crushed stone are ideal materials for the fire pit cap, and the stones in the center of the pit, respectively. 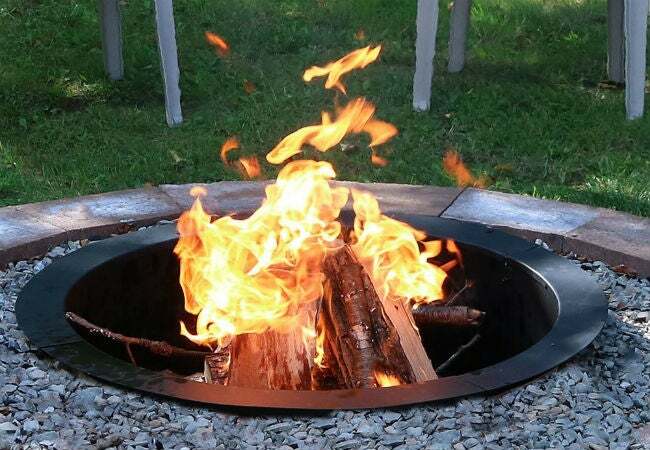 No part of the fire pit should be made with flammable materials (e.g., plywood shipping pallets) or non-porous materials that hold water, such as pea gravel, river rocks, or compressed concrete blocks; these materials can trap steam and eventually explode. DO install a steel ring in the fire pit. When building a fire pit, lining the innermost wall with a steel fire ring (available on Amazon from brands like Sunnydaze Decor) will prevent the wall material from drying out from regular exposure to the heat of the fire. As a non-combustible material, the steel will ward off heat and keep the wall itself from prematurely dehydrating and crumbling; this will preserve the looks and structural integrity of your fire pit longer. DO consider fuel supply equipment and emissions when determining fuel type. Ethanol, propane, and natural gas are all sound fire pit fuel options as they emit no smoke, sparks, or embers, and leave no ashes to clean up. Ethanol, the cleanest of all fuel types (it additionally burns without odor), must be supplied via an ethanol tank or tray and propane-fueled pits require a connection to a liquid propane tank. Natural gas-fueled fire pits have a more involved setup, however, as they require the gas company to install a supply line (do-it-yourself gas line installation isn’t recommended). While wood-burning fire pits require no gas lines, they kick up a high volume of smoke, sparks, and embers; call for frequent ash removal; and make large flames difficult to extinguish—all reasons why city planning departments commonly forbid them. DO factor in return on investment when weighing building costs. While a basic fire pit costs $700 on average, prices run the gamut from $300 for a DIY install of a homemade fire pit, to $1,400 or more for a professional install of a pre-built fire pit. 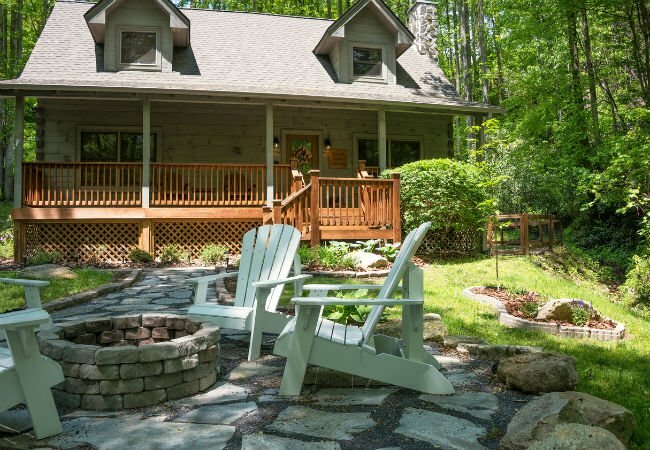 That said, fire pits are such a coveted architectural feature nowadays that you can expect to recoup 78 percent of your investment when you sell your home. DO invest in fire safety gear. If going forward with a fire pit installation, keep a fire blanket (a fire-retardant sheet usually made of fiberglass or Kevlar; available on Amazon from brands like Hot Headz) within reach to help smother the beginnings of a fire on nearby objects or people. Similarly, store a fire extinguisher in a nearby outdoor grill cabinet, shed, or garage. The extinguisher should be a multipurpose dry chemical model, which means it can effectively extinguish Class A (involving combustibles), B (involving flammable liquids), and C (electrical) fires.